Do you hate that old dresser with the scratches and dings? Or maybe that dated coffee table no longer works with your scheme, or the stains on the sideboard get you down. If you look at a tired bit of furniture and ache to replace it there is an alternative – chalk paint! If you’ve watched any renovation show in the past 5 years, you have seen the transformative power of chalk paint. Decorators and DIYers alike love chalk paint for breathing new life into old furniture and fixings, providing a vivid finish that can be modified to any interior or theme. If you want to chalk paint furniture but aren’t sure how to get started, you’re in the right place. In this article we give you the tips and tricks to get the perfect finish from your furniture chalk paint, and give you a rundown of some of the best chalk paint products available in Singapore. Oscar Wilde once said “Fashion is a form of ugliness so intolerable that we have to alter it every six months” and furniture is no exception to the rule. What was the height of style one year may be dark and blocky the next. But well-made, useful pieces will last forever. With chalk paint, furniture can be revived and renewed while keeping its vintage charm. The finish is matte (it is chalk paint after all, the surface is chalky), but once sealed with a wax or varnish this will mellow out. So what else should you know about chalk paint? Chalk paint gives old furniture a new life. You can keep the prep work to the absolute bare minimum – One of the reasons chalk paint is so popular is because of its “no prep necessary” claim but be aware that there are two camps – those who prep and those who don’t. It adheres well to most surfaces without a primer and all you need is to make sure they are clean. However, if your surface is smooth and glossy we would recommend you sand it down beforehand just to be sure (if it has varnish or gloss on it already for example). It’s easy to apply – Chalk paint goes on opaque and covers well. You might need two coats for full coverage, but there are is no need for thinning or anything tricky – unless you want to play with the finish, of course! It’s eco-friendly and safe – Chalk paint consists of minerals, pigments and water. It is completely free of harmful substances and is considered toy safe for children. 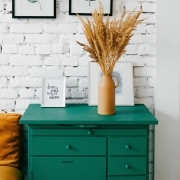 Milk paint is another non-toxic paint option. It’s fast drying – You can complete a project in a weekend, doing the undercoat on Saturday morning, the second coat Saturday afternoon, and sealing coat or wax on Sunday. Even though it may be dry to the touch, remember to give the piece 3-5 days to really cure before being too rough with it. You can play with texture and finish – The chalky matt finish of chalk paint will retain brush marks which is part of its appeal. The paint can easily be given a worn, vintage look by playing around with a sanding block or steel wool, using different colours for base and top coats can provide interest and a layered look, thinning the paint can make it seem more like a stain or wash that an opaque colour. It’s up to you! Though a chalk paint furniture makeover may be easy, it can still be intimidating to a beginner. So here are the top tips and tricks for getting the perfect finish first time. Buff chalk paint to give your piece an antique look. If you’re nervous, start small – Get your eye in with a smaller or simpler project, a flat surface or something you won’t mind not getting perfect. Practice your brushstrokes on a surface that isn’t so visible – the side or even underneath – so you feel more confident and know what to expect when you tackle the more important surfaces. Do not skip the cleaning – Though you may not need to sand the whole piece, you definitely need to clean it. Wash it down with mild soapy water and make sure to get any oil and grease spots. Do sand out or fill dings and scratches that you don’t want to show through your final finish. Long and even brushstrokes – Go with the grain and apply the paint in long sweeping strokes. Chalk paint dries fast so work quickly and try to make your brush stroke stretch over the whole length of the surface you are painting. If the paint is too thick you can thin it with a little water. Don’t give up after the first coat! – The first coat won’t look great. In fact, you may have a moment of panic. Fear not! The second coat will go on more smoothly and you will see what everyone is talking about. Sand the paint after the second coat for a smoother finish – Using a very fine sandpaper (220 grit), lightly sand the surface of your paint. Don’t wear through the chalk paint, just leave with a smoother finish than the chalky matte that will still work with the waxing or sealing. Layer your colours for an interesting finish – If you use a different colour for your first and second coat, the distressing sanding will reveal the colour of the layer underneath, giving the piece an interesting worn and layered appearance. Old timey charm – If you are going for the rustic look, sand down the paint once you are finished. Focus on edges and drawers that would be more likely to get knocked and worn to give it an authentic feel. A little wax goes a long way – Don’t stick your wax brush directly into the wax. You need to control the amount you use so you don’t overdo it – put some of the wax on a tray and work from there. Apply it in thin layers, it really doesn’t take much. With the popularity of chalk paint it is no surprise that you can now find it everywhere. But what are the best products? Below we have outlined some of the top chalk paint brands available in Singapore. Annie Sloan started it all, and is still a favourite among aficionados. This is *the* chalk paint, the one that started it all. 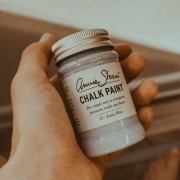 Developed as a furniture paint that was versatile and easy to use, Annie Sloan chalk paint quickly took off. Annie Sloan also produces the waxes and lacquers for sealing their products. The paints are available in an exciting range of 42 colours including Giverny (a summery blue), Antibes Green (a soft grass green), Scandinavian Pink (dusky and warm), and Old White. The chalk paint waxes come in clear, dark, white, and black. Annie Sloan chalk paint is available in Singapore from Big Blue Trunk. Designed for everyone including the laziest of decorators (they even have a range called The Lazy Range), Frenchic Furniture Paint is designed to take any piece of furniture and transform it – shabby chic, retro, industrial, whatever look you want, they have it. Available in 25 colours and 3 ranges (Al Fresco, Lazy Range, and Original), they also sell their own waxes and finishes. With over 60 colours to choose from, you’ll find the look you are after with Dixie Belle Paint. Blacks, blues, greens, oranges, pinks, reds, teals, yellows… It’ll be difficult to just pick one!